hybrid 100 ohm terminating load resistors rated at 250 watts continuous power dissipation when installed on an appropriate heat sink. 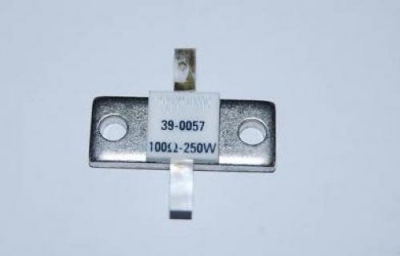 It is a solder in type part with no RF connectors, and 500 watts PEP for short periods. They measures approximately 2 inch long x 1 inch wide x .25 inch high and are rated up to 2000 mHz with a VSWR of less than 1.3. For pulse operation, the part is rated at 2500 watts for 1% duty cycle and pulses less than 100 microseconds. These parts are good to build your own load or for terminating isolator circuits on RF amplifiers.